THE ABSENCE of background glare proved a decisive factor when pie manufacturer Pukka Pies sought an improved colony counter for use at its microbiological laboratory in Leicester, UK. The Acolade colony counter from Synbiosis is used to count mixed colonies on TVC (total viable count) plates, as well as bacterial colonies including coliforms, Staphylococcus aureus, Enterobacter spp, and Clostridium perfringens on a range of media. The variety of tests performed is testament to the versatility of the system, says Synbiosis. Acolade has interchangeable backgrounds and an adjustable plate ring, making it suitable for counting shiny colonies and colonies on different plate sizes. “Our previous colony counter was white light based, which gave us a reflection problem, especially when we were counting white colonies on TVC media. We saw the Acolade advertised as being anti-glare and decided to give it a try. We have been using it for almost a year to count around 50 plates every day, and it is brilliant: reliable, sensitive and with a nice viewing magnifying glass. 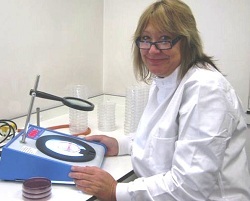 It suits our needs perfectly”, said Val Burton, laboratory supervisor at Pukka Pies. Pukka Pies makes over 60 million pies every year.